Free, but donations are welcome! Leymah was seventeen years old when the Liberian civil war started and turned her, in her own words, "from a child into an adult in a matter of hours." While the conflict raged, she became a young mother and eventually trained as a social worker and trauma counselor, working with ex-child soldiers. She came to believe in women's responsibility to the next generation to work proactively to restore peace, and she became a founding member and Liberia Coordinator of the Women in Peacebuilding Network (WIPNET) of the West Africa Network for Peacebuilding (WANEP). Inspired by a dream and as a person of faith, she organized her fellow Christian women to mobilize for peace. 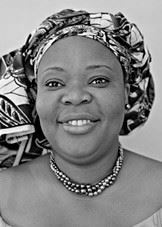 She then collaborated with a Muslim partner to build an unprecedented coalition with Muslim women, giving rise to the interfaith movement known as the Women of Liberia Mass Action for Peace (which operated under the auspices of WIPNET). Leymah was appointed its spokesperson and led the women in weeks-long public protests that grew to include thousands of committed participants. Leymah led the Women of Liberia Mass Action for Peace participants in public protests that forced Liberia's ruthless then-President Charles Taylor to meet with them and agree to take part in formal peace talks in Accra, Ghana. She led a delegation of women to Accra, where they applied strategic pressure to ensure progress was made. At a crucial moment when the talks seemed stalled, Leymah and nearly 200 women formed a human barricade to prevent Taylor's representatives and the rebel warlords from leaving the meeting hall for food or any other reason until, the women demanded, the men reached a peace agreement. When security forces attempted to arrest Leymah, she displayed tactical brilliance in threatening to disrobe – an act that according to traditional beliefs would have brought a curse of terrible misfortune upon the men. Leymah's threat worked, and it proved to be a decisive turning point for the peace process. Within weeks, Taylor resigned the presidency and went into exile, and a peace treaty mandating a transitional government was signed. Leymah's impact on the world had only just begun. She had emerged as a global leader whose participation was in demand at meetings of the United Nations Commission on the Status of Women and other major international conferences. In 2006, she co-founded the Women Peace and Security Network Africa (WIPSEN-A) in Accra and went on to serve as its Executive Director for six years. WIPSEN-A is a women-focused, women-led pan-African nonprofit organization dedicated to promoting women's strategic participation and leadership in peace and security governance on the continent. WIPSEN-A's leadership development programs in both Ghana and Liberia have transformed the lives of countless young women. Furthermore, Leymah's story as told in the 2008 documentary film Pray the Devil Back to Hell and her 2011 memoir, Mighty Be Our Powers – as well as her lectures and discussions with groups large and small – have engaged, inspired and motivated untold numbers of people worldwide. She holds a M.A. in Conflict Transformation from Eastern Mennonite University (Harrisonburg, VA). She also received a Doctor of Laws (LLD) honoris causa from Rhodes University in South Africa and the University of Alberta in Canada, and a Doctor Honoris Causa in Specialty Management and Conflict Resolution from the Polytechnic University in Mozambique. In 2013, she was named a Distinguished Fellow in Social Justice, a Visiting Transnational Fellow at the Center for Research on Women and Fellow in Residence at the Athena Center for Leadership Studies at Barnard College. Leymah was honored as a flag-bearer for the opening ceremony of the 2012 Olympic Games in London. She is the proud mother of six children.